The first encounters with the L-6 frigate came during the Four Years War. Though few of them were met in actual battle, those that did were usually victorious; none was ever captured and only three were destroyed. On Stardate 1/9602, in an engagement that was to typify all subsequent encounters with these vessels in the war, two Larson class destroyers and a Loknar class frigate were bludgeoned by a single L-6. The destroyers Eylau and Jutland were patrolling the outer fringes of the Falgor system, left behind with the frigate Proxima when the main body of the Federation fleet withdrew to reform and ready itself for the inevitable Klingon thrust. The destroyers encountered the L-6 as it entered the area, readied themselves for combat, and dispatched a message to the Proxima requesting assistance. The Jutland called for the Klingon vessel to surrender as it approached. The L-6 responded by firing on the Eylau, damaging its impulse drive system. The Jutland closed to extreme range and opened fire, but the damage it inflicted was negligible. While the Klingon ship was concentrating on the incoming Jutland, the Eylau managed to damage a warp engine, causing the L-6 to turn on the Eylau with a withering barrage, destroying the Eylau’s warp drive controls and causing it to go dead in space. Once again, the Jutland fired to minimal effect, and the L-6 renewed its fire on the Jutland, which was no match for the Klingon frigate either in terms of firepower or range. The Jutland received one damaging blow after another, all from extreme range for its weapons. When the L-6 eventually closed for the kill, it was frustrated by the arrival of the Proxima. Approaching the Klingon from the rear, the Proxima closed rapidly and delivered a devastating blow to the engineering section, only to be surprised by the Klingon’s aft-firing disruptors, which delivered a volley into the bridge and forced it to withdraw. Luckily for the Federation vessels, the moderately-damaged L-6 decided to withdraw, leaving the Eylau damaged beyond repair, the Jutland severely damaged, and the Proxima lightly damaged. The L-6 went through an interesting change around Stardate 2/09, when the warp engines were changed from the KWD-1 to the KWE-1, and the impulse system was upgraded to the more powerful KIE-2. The warp engines delivered less power than the earlier designs but were more efficient. The impulse system increased its power output over the earlier system by 600%. The overall output of power decreased, however the maneuverability increased. Further changes included the addition of more troops and shuttlecraft as well as improved weaponry and shields. This modification did not alter the basic weakness in the L-6 design, its amidships warp engines. The L-6 would again see an update in 2288, when the J model was improved with new KD-8s. The class also included a forward torpedo, a weakness that had long been frustrating for field commanders. In 2290, the K model was introduced to bring the I model to a more efficient level of operation. In 2343, as the Empire struggled with retiring or upgrading a number ships. A previous refit to the L-6 had not proven effective and the decision to upgrade the L-6 was controversial, but was approved after lengthy design review. The L-6M improved weapon systems, shield and increased the armor of the still popular frigate. Despite it’s age, the L-6 was used on the front lines of the Dominion War. over 80 were destroyed during that conflict. This was the only period in time that Star Fleet got a close up look at the L-6. Of the approximately 450 L-6s built, about 93 remain in active service and about 143 have been destroyed; evidence shows that 12 are listed as missing, 37 are believed to have been scrapped and 11 are believed to have been captured. 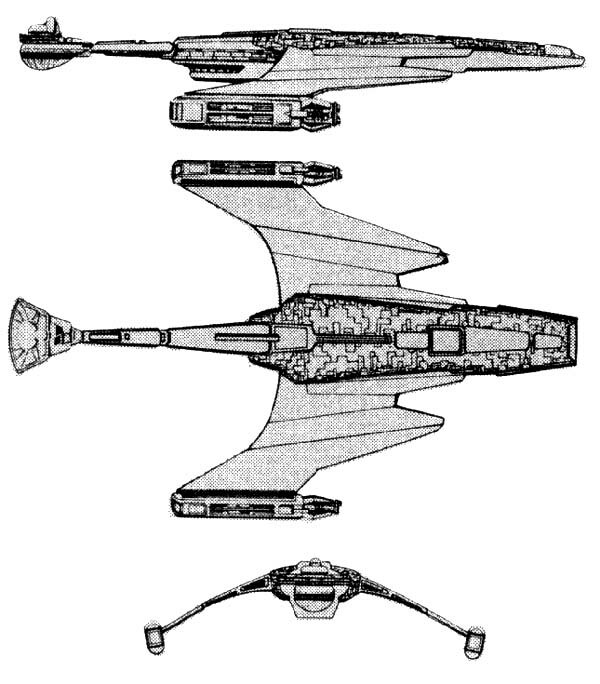 10 were sold to the Romulans and 130 are known to be in reserve fleets. 6 are confirmed in service to Ranking Families in the Empire. Operation Dixie reports indicate that the L-6 was produced at the Kodal facility. The class name is translated from the Klingon th’lar. Power Units Available – 18 ea. 18 ea. 11 ea. 18 ea. 18 ea. 18 ea.